Park near the Greyneys Shelter off Highway 73 near Arthurs Pass. The track begins at the eastern end, and it loops round to the west. 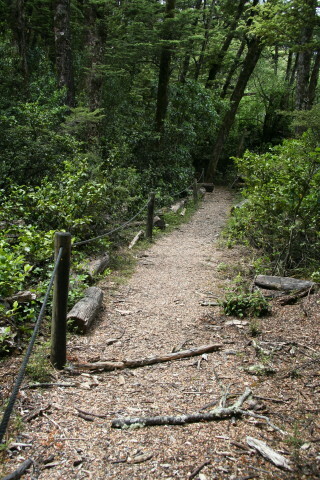 The top part includes a rope handrail, intended to be a guide as you walk through the forest with your eyes closed! This is supposed to help you imagine the task of the old horse coach drivers who had to navigate the early tracks through Arthur's Pass. The track is well marked and the loop easy to follow, but strangely there is no sign say "Old Coach Road" (refer to Arthur's Pass walking guide brochure). Park beside Greyneys Shelter on Highway 73 6 km east of Arthur's Pass village.